Illuminer, Steve McQueen's most recent film, elevates a mundane setting to that of a Baroque staging and imbues the cold glow of a television set with an air of discernment. The camera remains static: the immediate impression is of a dimly lit hotel room, devoid of human presence. The only motion is that of light and sound emanating from an invisible television. The initial absence of life draws attention to the constant change of texture and focus. The incessant blurring and sharpening of the image seems curiously to follow the sound and the brightness of the television and induce a sensual painterly resonance. This very pictorial technique is similar to the disconcerting, deliberate alterations and effects used by Belgian painter Luc Tuymans, an artist who refers to such "suspension of visual logics" as the points of entry into his paintings. In Illuminer the subtle combination of stillness and interference enables the viewer a point of entry. The artist himself abruptly penetrates the stage and lies on the bed, occupying half of the frame. Observing this figure watching television offers no voyeuristic pleasure, but rather suggests an indistinct human presence. The dramatic light effect from the television draws a Caravaggio-like silhouette against the whiteness of the sheets. It has the intensity of a retinal image that remains imprinted on the mind after the eyes are closed. This dream-like state recalls the last moments of struggle when attempting to concentrate on a book or television before falling asleep. The 'blurring filter' is important in Illuminer: it is a technique used by contemporary painters whose work directly relates to photography as well as, more remarkably, the 17th century Diego Velasquez. Velasquez often stimulates our perception by staging his painting with a point of focus that is meticulously blurred. In Illuminer, the viewer is similarly encouraged to see beyond the orchestrated reality. An issue raised here is the question of how one individual perceives an unknown reality when filtered through the standardised language of mass-media. More than a direct response to a particular event, the film becomes an interpretation of modern War rhetoric. Within its successive layers of translation, the loud, bombastic French TV program about armed forces in Afghanistan has a hint of propaganda and contrast with the serenity of the room and the passiveness of the viewer. In the last minutes of the film, the man covers himself with a protective blanket that distances him a little further from the outside world. The undulating folds of the bed-covers fuse into the semi-darkness and recall that of an abstract composition some what like mist. Poetic and balletic, Steve McQueen's Prey is one of the artist's most elusive and enigmatic pieces. The work, composed of two symmetrical yet contradictory movements, balances between sentiments of imminence and permanence. 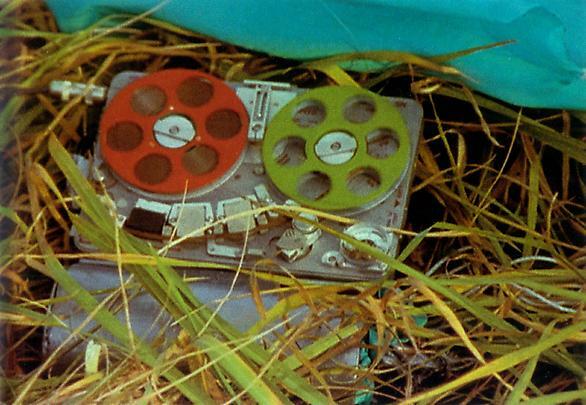 The film opens with a tape recorder lying on the grass. It looks not to have been carefully positioned but to be a discovery, an archaeological find of a discarded object. The tape recorder is activated by an anonymous hand, and emits a hypnotic rhythm that seems to mark the beginning of a countdown to an ineluctable incident. The sound's familiar yet enigmatic. It conveys rapid movement as well as the conviction that something unseen is happening. It has hallucinogenic effect of a litany and the precision of a Morse Code message, but is in fact the sound of human notion, a piece performed by a tap-dancing prodigy. When movement occurs in the film it is sudden and unanticipated. Inexplicably, the tape-recorder is hoisted into the air and the whole panorama comes into view. For a moment the machine remains mysteriously suspended by an invisible thread, and then is swept up into the white sky by a white balloon. The sound of tap-dancing becomes curiously airborne. The upward motion of the tape recorder seems to contradict nature: to create the rhythm, the tap dancer is rooted to the ground. The dancing should reassert gravity, but this force is defied by the weightlessness of the sound. Although lifted ever further from the ground, the machine and its sounds become increasingly imperceptible but never disappear, permanently suspended before the camera. There exists an antagonism. The tape-recorder is brutally snatched from the ground and taken away, yet the lift also evokes a rapturous ascension towards the heavens. In the opening sequence of Stanley Kubrick's 2001: A Space Odyssey a bone, taken from the ground by prehistoric man, is thrown into the air; the vision of this spinning shape against the sky is then echoed by that of a rotating space station. This famed passage is a metaphor for human evolution and progress. In Prey, the boundless elevation is visually and conceptually evocative of a similar journey. The machine may carry a message sent to the universe, reminiscent of the plague aiming at representing humankind and our knowledge affixed to the space vessel Voyager: its destination and recipient are unknown, the potential breadth of its communications is limitless.